Policing is a Dirty Job, But Nobody's Gotta Do It: 6 Ideas for a Cop-Free World | C.O.B.P. 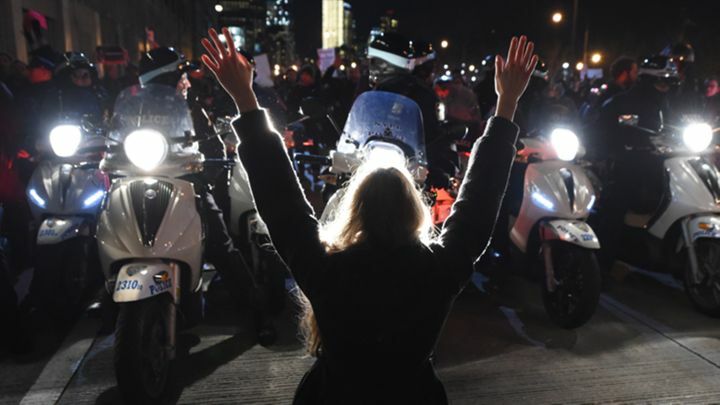 After months of escalating protests and grassroots organizing in response to the police killings of Michael Brown and Eric Garner, police reformers have issued many demands. The moderates in this debate typically qualify their rhetoric with "We all know we need police, but..." It's a familiar refrain to those of us who've spent years in the streets and the barrios organizing around police violence, only to be confronted by officers who snarl, "But who'll help you if you get robbed?" We can put a man on the moon, but we're still lacking creativity down here on Earth. What is considered criminal is something too often debated only in critical criminology seminars, and too rarely in the mainstream. Violent offenses count for a fraction of the 11 to 14 million arrests every year, and yet there is no real conversation about what constitutes a crime and what permits society to put a person in chains and a cage. Decriminalization doesn't work on its own: The cannabis trade that used to employ poor Blacks, Latinos, indigenous and poor whites in its distribution is now starting to be monopolized by already-rich landowners. That means that wide-scale decriminalization will need to come with economic programs and community projects. To quote investigative journalist Christian Parenti's remarks on criminal justice reform in his book Lockdown America, what we really need most of all is "less." Also known as reparative or transformative justice, these models represent an alternative to courts and jails. From hippie communes to the IRA and anti-Apartheid South African guerrillas to even some U.S. cities like Philadelphia's experiment with community courts, spaces are created where accountability is understood as a community issue and the entire community, along with the so-called perpetrator and the victim of a given offense, try to restore and even transform everyone in the process. It has also been used uninterrupted by indigenous and Afro-descendant communities like San Basilio de Palenque in Colombia for centuries, and it remains perhaps the most widespread and far-reaching of the alternatives to the adversarial court system. Reducing crime is not about social control. It's not about cops, and it's not a bait-and-switch with another callous institution. It's giving people a sense of purpose. Communities that have tools to engage with each other about problems and disputes don't have to consider what to do after anti-social behaviors are exhibited in the first place. A more healthy political culture where people feel more involved is a powerful building block to a less violent world. This one is a wildcard. Community patrols can have dangerous racial overtones, from pogroms to the KKK to George Zimmerman. But they can also be an option that replaces police with affected community members when police are very obviously the criminals. In Mexico, where one of the world's most corrupt police forces only has credibility as a criminal syndicate, there have been armed groups of Policia Comunitaria and Autodefensas organized by local residents for self-defense from narcotraffickers, femicide and police. Obviously these could become police themselves and then be subject to the same abuses, but as a temporary solution they have been making a real impact. Power corrupts, but perhaps in Mexico, withering power won't have enough time to corrupt. In 2012, Mayor Rahm Emanuel closed up the last trauma clinics in some of Chicago's most violent neighborhoods. In New York, Rikers Island jails as many people with mental illnesses "as all 24 psychiatric hospitals in New York State combined," which is reportedly 40% of the people jailed at Rikers. We have created a tremendous amount of mental illness, and in the real debt and austerity dystopia we're living in, we have refused to treat each other for our physical and mental wounds. Mental health has often been a trapdoor for other forms of institutionalized social control as bad as any prison, but shifting toward preventative, supportive and independent living care can help keep those most impacted from ending up in handcuffs or dead on the street.